The confocalDT 2421 and 2422 controllers open up new possibilities in precision distance and thickness measurement on different surfaces. The two-channel variant is an innovation whereby two confocal sensors are connected to a controller. For measurements, the sensor system uses the respective light wavelength which is exactly focused on the target. The light reflected from this point is imaged by an optical arrangement onto a light sensitive sensor element, on which the associated spectral color is detected and evaluated. With each change of the material's refractive index »n«, part of this light is reflected back, which enables one-sided thickness measurements to be made. In the case of multi-peak measurements, several distance points are evaluated accordingly. Particularly for diverse measurement tasks in the glass industry where typically high throughput rates occur, the new confocalDT 2421 and 2422 confocal controllers are ideal. Therefore, it is possible to perform multi-track measurements on flat glass, two-sided thickness measurements and multipoint thickness measurements on container glass using only a single controller. However, the systems can also be used when measuring oscillating metal sheets, for quality assurance purposes in mobile phone production, as well as in OEM applications. A special calculation function in the controller enables the evaluation and averaging of both channels, e.g. in order to determine the thickness value. Measurement acquisition is synchronous and can be carried out while exploiting the full measuring rate for both channels. 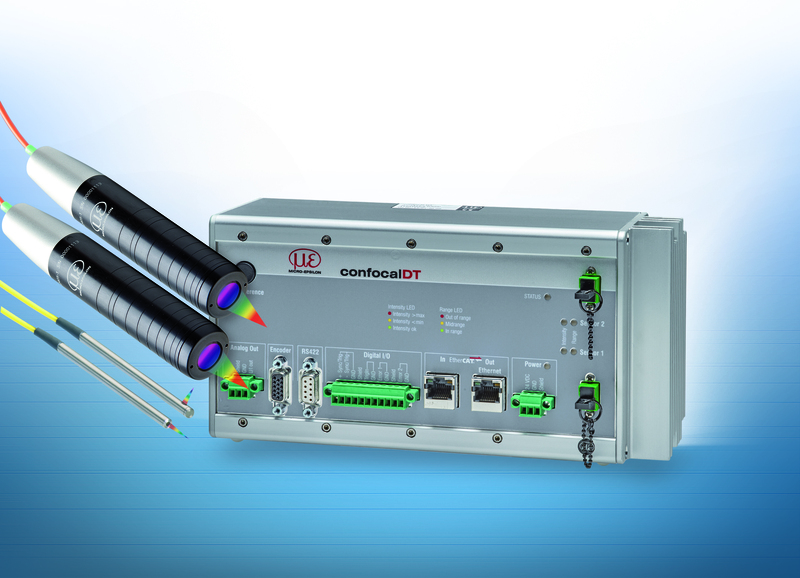 The confocalDT 2421 and 2422 controllers are a cost-effective solution particularly for high volume applications. In contrast to systems using an oscillating lens, confocalDT is entirely wear-free. The sensors are designed for passive measurements and do not need any electrical components. They do not give off heat, which makes them suitable for use in sensitive environments. Due to a user-friendly web interface, the entire configuration process of the controller and sensors is carried out without using any additional software.